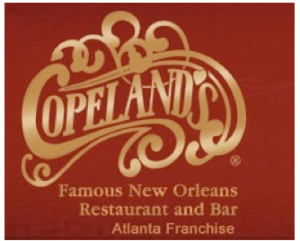 In 1998, Copeland's of New Orleans – Atlanta franchise was just starting out, but now in 2013 they are excited to celebrate their 15th Anniversary with all of their guests! The celebration will be in three parts (every month from now until their true anniversary date!). For the first part of their celebration they are bringing back the National Cheesecake Day promotion that everyone loved so much! All day on Tuesday, October 15 Copeland's will be offering buy one, get one free offers on their delicious cheesecakes to celebrate the first installment of the 15th Anniversary! If you are excited for the 15th Anniversary cheesecake day, then you are really going to be excited for what Copeland's has in store for Friday, Novemeber 15. I'll give you a hint…its in honor of New Orleans' most famous holiday…MARDI GRAS! They will be hosting a Mini Mardi Gras celebration for the second installment of their anniversary celebration. There will be food and drink features as well as a Live Jazz Band. The third, and probably most exciting, installment of the celebration is the December celebration, which is the true 15th Anniversary. On December 2, 1998 Copeland's Restaurant opened its Cumberland location doors for the first time! Now 15 years later they are having a party to celebrate! Keep in touch for more details through their Loyal Customer Club. Be on the look out for upcoming deatils for the Mini Mardi Gras and Anniversary Party! Copeland's is looking forward to seeing you on October 15 for their special anniversary cheesecake day!